Despite a lack of documentary evidence, the Crusader Bible has long been associated with King Louis IX of France (1214–1270) and was most likely produced in Paris during the middle of the thirteenth century. At that time, manuscript production was carried out in a decentralized workshop. Specific tasks, such as parchment preparation, illumination, and bookbinding, were distributed among numerous artisans. Differences between the initial preparatory designs, which remain partially visible under the paint layer, and the final illuminations indicate that there was considerable freedom of execution afforded to both groups of draftsmen. Several distinct painting styles can be detected in the final illuminations, which suggest that they were created by up to seven different hands. 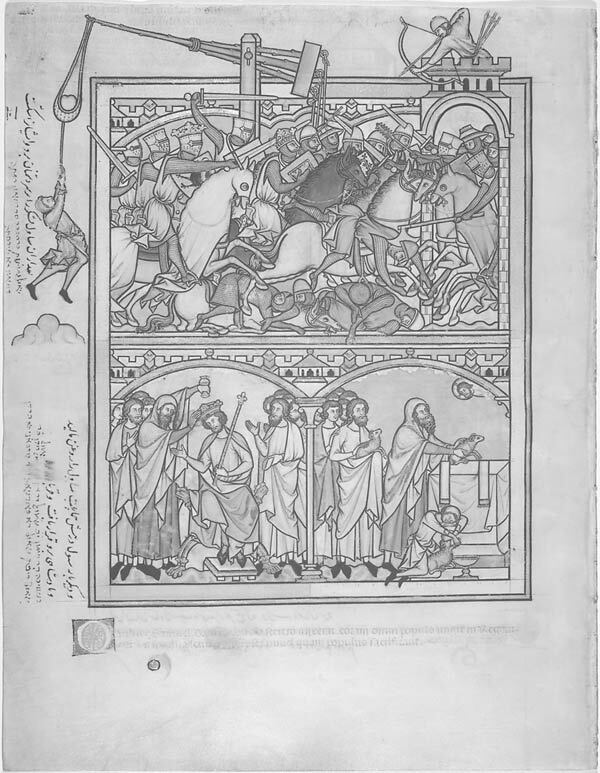 The Crusader Bible was originally conceived as a picture book depicting Old Testament stories in vivid detail, although the manuscript’s margins are now filled with ink inscriptions. The Latin, Persian and Judeo-Persian captions are all later additions that were made by subsequent owners and give insight into the manuscript’s history following the death of Louis IX. 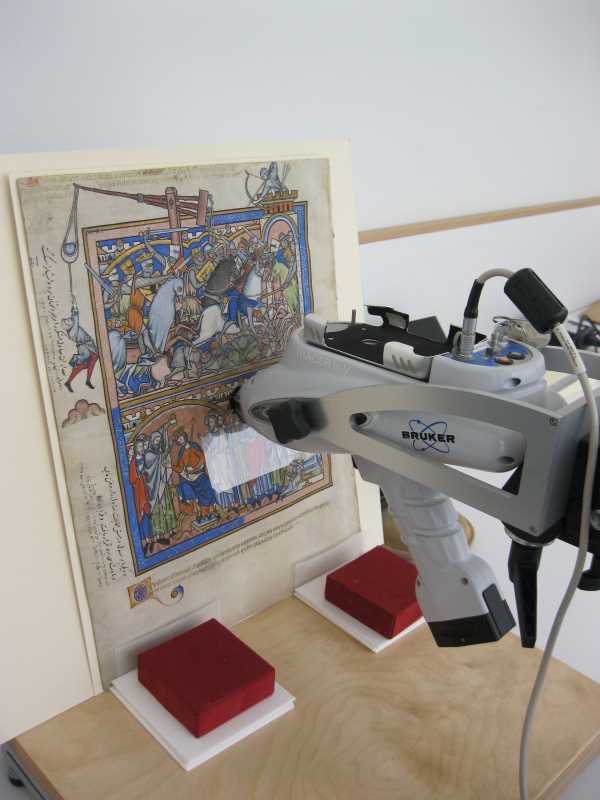 To enhance our understanding of the Crusader Bible, the Thaw Conservation Center performed non-destructive analysis including X-ray fluorescence spectrometry and digital imaging techniques to characterize the pigments in folios believed to be executed by different illuminators. This post will introduce the analytical methods used and the fascinating information that the data revealed about the Crusader Bible. The X-ray fluorescence spectrometer is secured to a tripod and positioned a few millimeters away from the pigment analyzed. X-ray fluorescence spectrometry (XRF) is a technique that can be used to identify the elemental composition of pigments. The instrument produces a beam of x-rays that interact with the pigment causing the elements present to emit secondary x-rays. These characteristic x-rays are collected by the spectrometer and displayed in a spectrum that indicates which elements are present. Based on the presence of certain elements, we can infer what pigment was used. XRF does not always provide definitive information because many pigments share key elements. Furthermore, elements having a low atomic number, such as those found in organic pigments and natural dyes, will go undetected. Because of the limitations of XRF, this technique is often used in conjunction with additional analytical methods. Each pigment consists of a different chemical compound, which will selectively absorb, fluoresce, transmit, or reflect radiant energy when exposed to a specific region of the electromagnetic spectrum. Only a narrow portion of the spectrum (400–700 nm) is visible to humans as light. Although ultraviolet radiation (100 - 400 nm) and infrared radiation (>700 nm) cannot be perceived with the human eye, a modified digital camera and a selection of filters can be used to record them visibly. 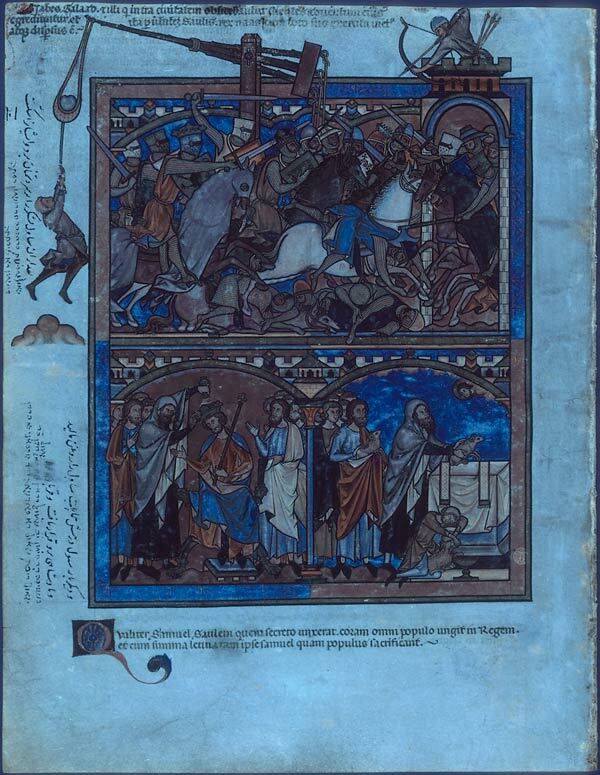 To further characterize the pigments used in the Crusader Bible, the manuscript was imaged under ultraviolet, visible, and infrared radiation. The spectral responses from the pigments in the illuminations were compared to the spectral responses from known paint samples. Image of folio 23v under longwave ultraviolet radiation. For this study, longwave ultraviolet radiation (UVA) was used to induce visible fluorescence. Many of the pigments used in the Crusader Bible absorb ultraviolet radiation. However, there are discreet areas in the folds of the clothing that fluoresce slightly. In these areas, the paint was applied as a glaze or a thin translucent layer. The pigment was probably bound in glair, a medium consisting of egg white, which fluoresces when exposed to ultraviolet radiation. The parchment support also fluoresces slightly. Reflected infrared image of folio 23v. Infrared analysis can be used to detect drawings and inscriptions that have faded or have been erased or abraded, to reveal preparatory drawings under layers of opaque paint, to distinguish different formulations of writing inks, and to identify pigments. In the Crusader Bible, the Persian and Judeo-Persian inscriptions in the left margin of folio 23v were written in carbon black ink. This ink is very absorbent of infrared radiation and appears dark in the infrared image. The Latin inscriptions in the upper and lower margins were written with iron-gall ink, which transmits infrared radiation and is nearly invisible in the infrared image. A false color infrared composite of folio 23v. A false color infrared image can further assist with material identification. The image is prepared by importing the reflected infrared image into the visible image using Adobe Photoshop and following a specific channel-substitution scheme. The combination of infrared and visible absorbency properties results in distinctive “false” colors that facilitate pigment identification. Different pigments can have similar responses to ultraviolet, visible, and infrared radiation. Therefore, it is necessary to employ additional analytical techniques to identify materials. The Latin inscription is written in iron-gall ink; the Persian and Judeo-Persian inscriptions are in a carbon-based ink. Although it is likely that different artisans were responsible for the creation of the illuminations in the Crusader Bible, the pigments used throughout the manuscript are relatively consistent. In addition to the colorants listed above, some folios also contain a yellow iron oxide, an organic yellow and gold leaf. In Europe the term ultramarine, meaning “across the sea," served to distinguish the blue pigment derived from lapis lazuli, a rare mineral, from other blue pigments. The primary deposits of lapis lazurite during the Middle Ages were found in Badakhshan, now a province of northeast Afghanistan. According to historical accounts, the process of extracting the pigment from the mineral was much more involved than the simple grinding and washing required to prepare other mineral pigments. Lapis lazuli contains an appreciable quantity of colorless crystalline materials including silica, calcite, and iron pyrites. Without proper preparation, the presence of these natural impurities will produce a pigment that is a pale grayish-blue. To attain the finest, purest color, ground lapis lazuli is kneaded into a paste of wax, resins, and oils under a dilute solution of lye. Preferential wetting causes the impurities to remain in the paste while the desired blue particles are washed out. It was common to carry out additional separate extractions, which would produce several grades of ultramarine of diminishing quality. 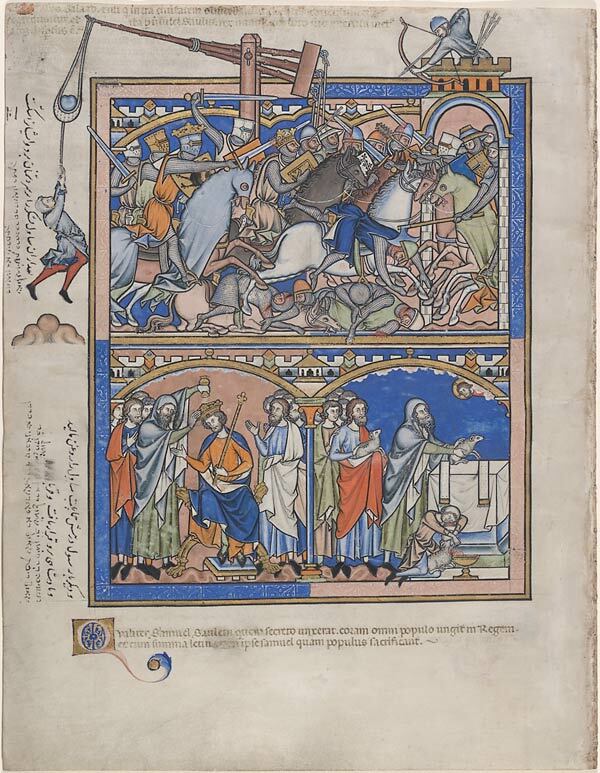 The use of ultramarine throughout the Crusader Bible is significant. The prohibitive cost of importing the mineral and extracting the pigment from the stone compelled many artists to use the color sparingly or to employ less expensive blue pigments such as azurite. Ultramarine was a symbol of luxury, and its abundant use throughout the Crusader Bible points to the elevated status both of the patron and of the artisans who created the illuminations. Cennini, Cennino. The Craftsman’s Handbook. New York: Dover Publications Inc., 1960. Eastaugh, Nicholas. The Pigment Compendium: A Dictionary of Historical Pigments. Amsterdam; Boston: Elsevier Butterworth-Heinemann, 2004. Frey, Franziska. The AIC Guide to Digital Photography and Conservation Documentation. Washington D.C: American Institute for Conservation of Historic and Artistic Works, 2011. Gettens, Rutherford J., and George L. Stout. Painting Materials: A Short Encyclopedia. New York: Dover Publications Inc., 1966. Merrifield, Mary P. Medieval and Renaissance Treatises on the Arts of Painting. New York: Dover Publications Inc., 1999. Noel, William, and Daniel Weiss, eds. The Book of Kings: Art, War and the Morgan Library’s Medieval Picture Bible. Baltimore: Walters Art Museum, 2002. Plesters, Joyce. “Ultramarine Blue, Natural and Artificial,” Studies in Conservation. Vol. 11, No. 2. (May 1966). Shugar, Aaron. “Peaking Your Interest: An Introductory Explanation of How to Interpret XRF Data,” Western Association for Art Conservation Newsletter. Vol. 31 No. 3 (2009). Shugar, Aaron, and Jennifer Mass, eds. Handheld XRF for Art and Archeology. Belgium: Leuven University Press, 2012. Thompson, Daniel V. The Materials and Techniques of Medieval Painting. New York: Dover Publications Inc., 1970. This post was created in conjunction with the exhibition The Crusader Bible: A Gothic Masterpiece (October 17, 2014 through January 4, 2015). The technical analysis was undertaken by Elyse Driscoll, graduate student in the Art Conservation Department at SUNY Buffalo State, in consultation with Frank Trujillo, Associate Book Conservator of the Morgan's Thaw Conservation Center and William Voelkle, Curator and Head of the Medieval and Renaissance Manuscripts Department. We are grateful to the Conservation Center, Institute of Fine Arts, New York University for providing their handheld X-ray fluorescence spectrometer for this study.